A very long day today, after pumping air in the bicis again we left Sahagun at about seven in the morning. It was the morning after the corrida, the barriers to keep the bulls from our albergue were up, there were still to be 2 more days of Fiestas, We wanted to stay to see the bull fights but we needed to move on. A very smooth and somewhat flat ride (nothing is really flat over here) At about ten in the morning we stopped for Marmalade and butter. We had cherries and bread from yesterday, we sat for about 30 minutes and enjoyed our mid morning snack with a couple of Americans that invited us to sit with them. 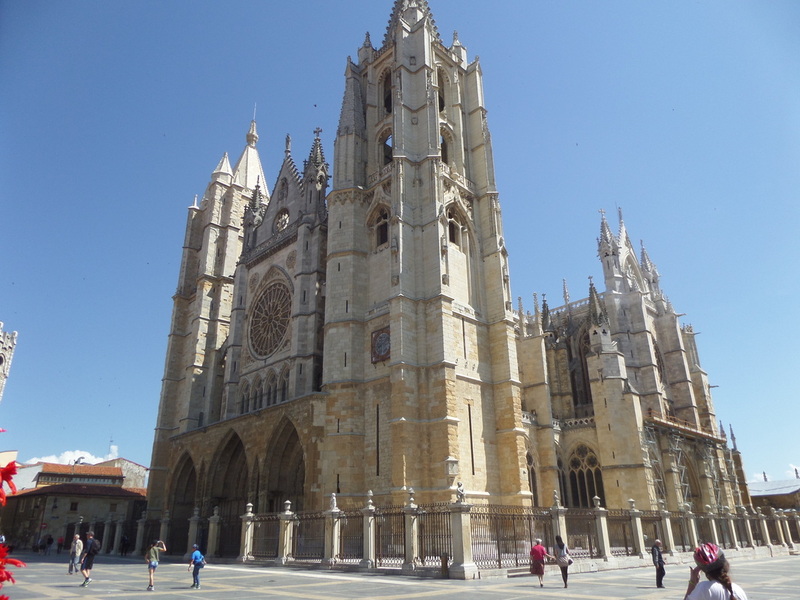 At about 12 we arrived into Leon, a very large city, we were supposed to contact one of mom’s teachers there to stay the night , but it was too early in the day to be stopping. We rode slowly through heavy traffic, in the city center there were not as many cars but there were lots of people walking around at lunch time. 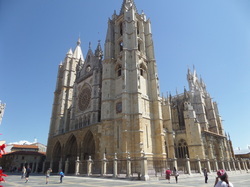 The big cities did not offer the calm charm of the towns or villages but we had to go through Leon. Jessy wanted Pizza, many of the restaurants did not open till 1pm. We were just about to ride out of town , but we were tired and hungry when we decided to stick around and have lunch. We found a Pizza place just as it opened; we walked in and were the only costumers for the hour and a half we were there. We ordered a Large Pizza each or what would be a medium for us. As we were the only people in the restaurant, Jessica took about a 30 minute nap on the chairs to get a long rest before heading out to the road again. Jessica was still in pain from her infection and was now on medication again, this time a pill every 12 hours or so. We rode our bikes to a nearby Supermercado; this one was really large in their standards, about the size of two Walgreen's. Keep in mind that all the supermercados we have experienced so far in all the small towns were about the size of a one car garage. We bought more fruit and a few sweets. 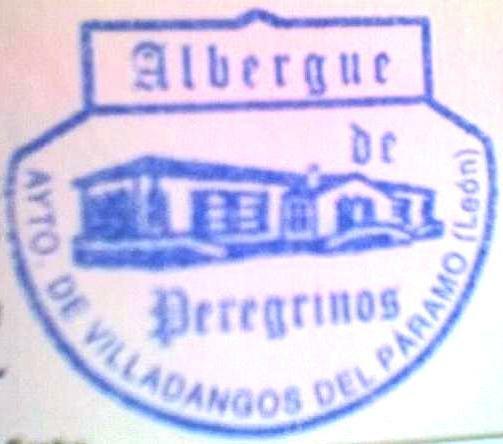 We rode our bicis outside of Leon to an albergue named Virgen del Camino. We slept in the lawn for a couple of hours in the middle of the afternoon. But it was time to move on, Jessica was worn out, her pain had come back but we needed to move on. The next village was still 14 kilometers away, we needed to get to Villadangos, the reason was that the albergue we planned on staying at had closed down. Jessy now in more pain, yet moved on with the help of the infection medicine and my pain pills. Most of my rib pain had now calmed down; I hesitated taking the pain pills not knowing what Jessica would need to control her own pain. We rode up into the Albergue and got beds for 5 Euros each. Right away I asked if there was a doctor in town, before taking showers we needed to find some relief for Jessica. As I was asking the hostelier about a clinic a peregrina in the same room tells me that she is a nurse. She asked how she could help, that she is a nurse, we talked about Jessica’s pain and she said she may have something to help her out. She went into her room and dug out lots of medicine, I wasn't sure about receiving pills from a stranger in an albergue. She did not have anything but gave us the name of something that would help the infection. Still dirty and sweaty from the day's ride we went to a clinic a few blocks away . When we walked into the clinic, I thought that they were never going to sell us this drug without a doctor’s prescription but the pharmacist asked me a few questions and 10 minute later Jessica had new medicine to take, a pill every 12 hours. We returned to the Albergue and had leftover Pasta that some other peregrinos had offered Jessica earlier in the evening, this time without much flavor as we were limited in what was at this albergue. Now at about 10 pm the 2014 World Cup from Brazil is about to begin, the opening match Brazil vs. Croatia. Jessy and I watched a bit of the game crowded around a small computer in the common room with some Italian teenagers that were also doing the Pilgrimage. While the game is going on I changed another a tire, it was now about eleven p.m. – We were tired, I went to bed, but Jessy stayed up watching a little more of the game with the Italian boys. Today we did about 113 Kilometers.